Our partner on this project is Oxfam America, a relief and development organization that works to right the wrongs of poverty, hunger, and injustice. This is a one-year addition to a previous two-year pilot project in the System of Crop Intensification (SCI), which aims at increasing food production in ecologically sustainable ways. The effort, focused on Ethiopia’s Central Rift Valley, seeks to promote environmental friendly, economically feasible, and climate-smart agronomic practices among small-scale farmers by increasing the uptake of the SCI methodology. Our partners will identify 250 target farmers willing to adopt SCI (40% female); train 20 experts; train farmers in SCI; provide trial inputs (seeds, fertilizer); organize farmer-to-farmer learning and showcasing events; provide technical support to farmers; and document practices and lessons learned. Oxfam will be working with a local partner in Ethiopia, Sustainable Environment and Development Action (SEDA). A one-year addition to a previous two-year project. This is a new project with a new partner, Art Creation Foundation for Children (ACFFC), a US-based organization (founded 1999) whose mission is “to build a passionate community of future leaders, visionaries and dynamic thinkers who are empowered to better their lives and their world through the arts and education in Jacmel, Haiti.” ACFFC feeds over 100 kids daily. They had been providing two meals a day 5 days a week and three on Saturdays. Due to current funding shortages, however, they have been forced to reduce their feeding program to 2-3 minimal meals a week. This grant is expected to put the feeding program back at an acceptable operating capacity. Over a six month period, the grant from BGR would provide the necessary boost to ACFFC’s food budget to drastically improve its feeding program, returning to near the level it was previously. This is another SRI project with our partner, Oxfam America. 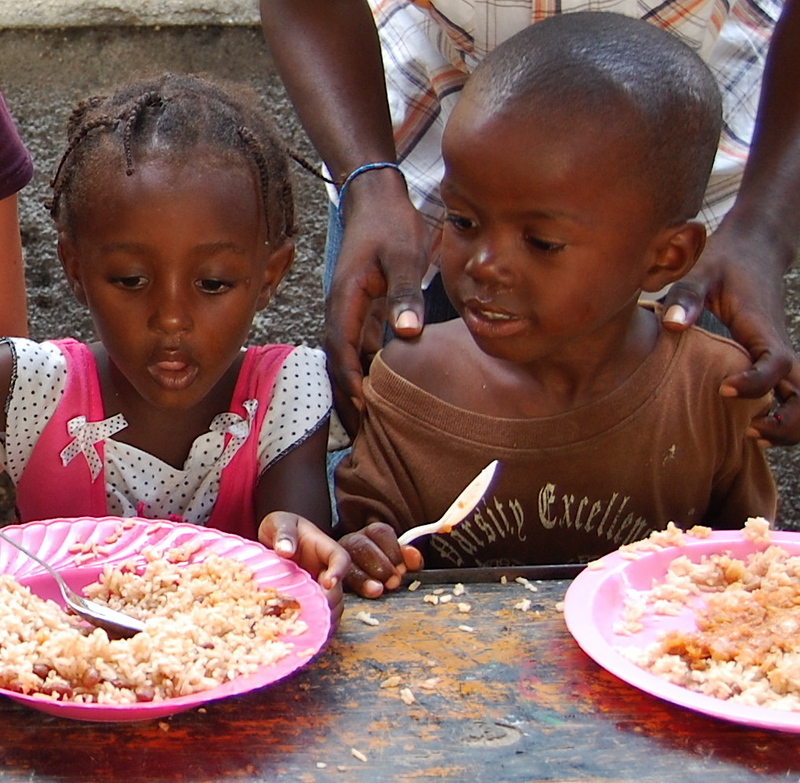 The project expands on a two-year BGR-funded effort focused in the Artibonite Valley in Haiti. Farmers in Haiti currently suffer from poor production, ineffective processing systems, and disorganized management in marketing, so 80% of Haiti’s consumed rice is imported. SRI will be promoted to a new set of farmers in the Bois Moreau and Grand Jardin crop blocks. Oxfam will be working with its new local partner, Association d’Irrigants Bas Mètre Rive Droite de la Petite-Rivière de l’Artibonite. The project aims to help 50 farmers (30% female) to achieve increased yields with fewer inputs using SRI. 425 farmers will benefit from irrigation and drainage infrastructure. The project will impart SRI trainer training, provide equipment, establish a credit fund, and offer technical and monitoring support. Canal rehabilitation will also be done. This is a renewal of our long-standing partnership with our partner, the What If Foundation, a US-based nonprofit founded in 2000. With support from BGR, WIF sponsors a community-based food program in the Tiplas Kazo region of Port-au-Prince, the capital of Haiti. The majority of the lunch program participants continues to be children, for whom in many cases this is their only meal of the day. Half of the BGR grant will cover 29,000 meals at Lamanjay’s Food Program starting June 2015. The other half will go toward the scholarship fund. WIF is presently supporting 163 young people through the School Scholarships program for the 2014-2015 academic year. Scholarships cover the cost of tuition, and occasionally assist with other associated costs, but generally families have to find a way to pay for other miscellaneous fees such as transportation, books, and uniforms. The BGR grant will provide $325 toward the scholarship costs of 29 elementary school students and $500 toward the costs of 21 high school students. Since tuition costs continue to increase, and the amount available for scholarships has remained level, the program’s goal is to continue supporting those current scholarship recipients to make sure that they are succeeding in school and working towards graduation. To gain acceptance to the program, all students were carefully chosen by the Education Team and were selected based on core criteria of need, character, and desire, as well as on their performance in other educational programs. Our Haitian partners report that 96% of the high school and elementary students we sponsored in the past three years graduated or advanced to the next grade level. This high pass rate is likely the direct result of the support the students receive from the Education Team in Haiti. Trees That Feed Foundation is a US-registered nonprofit whose mission is “planting trees to feed people, create jobs and benefit the environment with a focus on planting trees in school gardens in low income rural areas with food shortages.” TTFF presently works in Jamaica and Haiti and intends to branch out into Africa. The Foundation provides sustainable food sources to communities through fruit-bearing trees with edible fruit and high yields. TTFF supplies trees, equipment and training. This model improves nutrition and has the added benefits of providing long-term independence from food imports and agrochemicals. With BGR sponsorship, Trees That Feed will distribute 400 breadfruit trees to Jamaica and Haiti (200 in each country) along with processing kits to extend use of breadfruit beyond the fruit-bearing season. Breadfruit bears a fruit somewhat smaller than a soccer ball. One fruit can easily provide the carbohydrate portion of a meal for a family of five. A mature tree can produce up to a half ton of fruit per year. Fresh breadfruit is prepared similar to starch vegetables (boiled, grilled, fried). The BGR grant also covers the cost of breadfruit processing kits and driers so that the dried and milled fruit can be used as a flour substitute for baking and porridge. This entry was posted in Agriculture, Education, Ending global poverty, Engaged Buddhism, Food security, Global Hunger, News item, Projects & programs and tagged Children's hunger, Engaged Buddhism, Food hardship, Haiti, Oxfam, sustainable agriculture, What If Foundation. Bookmark the permalink.